WeddingSutra and Tanishq present stunning bridal looks for new age brides. 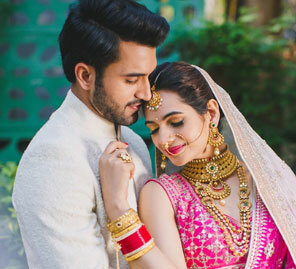 In our latest edition of Bridal Diaries - WeddingSutra and Tanishq curate top bridal trends for the new age bride while honoring the age-old traditions of the various communities. Our location for the second dispatch of Bridal Diaries was the uber-stylish JW Marriott Hotel Pune. Strategically located between the Mumbai-Pune Expressway and the Pune Airport, this elegant property is all about refined luxury, delectable on-site dining options, and an outstandingly convenient location. 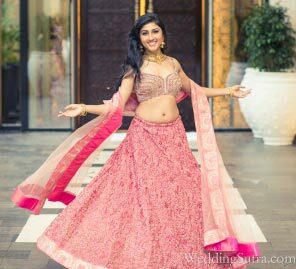 Team WeddingSutra discovered a range of contemporary venues and stylish experiences here. We have put together an inspiring storyboard to bring to life visions of a wedding at JW Marriott Hotel Pune. Some of the most elegant rituals and simple traditions are evoked in a Maharashtrian 'pheras' ceremony. And the Maharashtrian bride’s jewellery mirrors her innate modesty and grace. The bride layered different neckpieces by Tanishq Rivaah Wedding Jewellery including a choker-style 'Thushi', 'Lakshmi Haar', royal 'Kolhapuri Saaz' and a gorgeous 'Raani Haar'. An intricately crafted 'Nath' (nose ornament), 'Tode' and 'Patla' bracelets alongside customary green bangles complete the ethnic Maharashtrian bridal look. 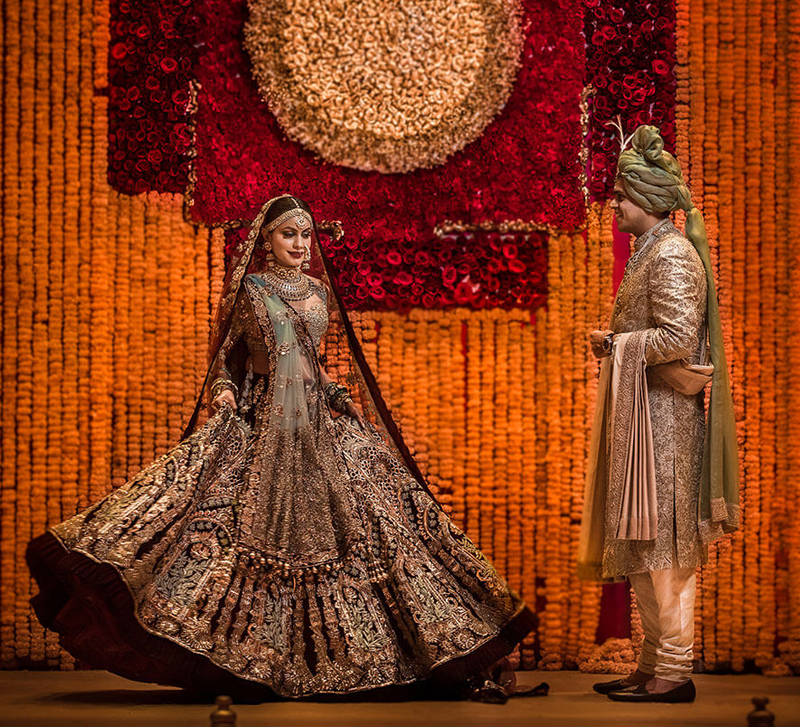 Watch the bride twirl in a stunning raw silk orange lehenga with intricate gotta-patti embroidery by Anita Dongre, while the groom wears a subtle ivory sherwani also by Anita Dongre. The bride looked fresh and festive with dewy makeup that included gold eyeshadow and coral shimmery lips from L'oreal. Her hair was tied in a bun and accessorized with 'mogra' (jasmine) blooms. The 'mundavlya' (string of pearl or gold beads worn across the bride's forehead that frames her face) was the perfect adornment that epitomized the traditional Maharashtrian bridal look. The mehndi is one of the most fun ceremonies at an Indian wedding. The Tanishq Rivaah 'Rani Haar' worn by the bride is a modern interpretation of regal bead work and timeless craftsmanship. The matte finish on the jhumkas lends an air of royalty to the midnight blue lehenga. The stacked kundan 'kadas'(bracelets) are a great accessory to enhance the simple yet elegant mehndi look. The new-age bride makes an entry in a contemporary midnight blue lehenga with a cape choli from SVA couture's Mon Passe collection alongside her groom in an understated kurta also by SVA from the Mahal En Maroc collection. The bride looked sun-kissed and sensational look included contoured cheeks, bold marsala lips and a boho hairstyle that was perfect for that cool mehndi vibe. There’s perhaps nothing more lively than a Sikh sangeet bash with everyone dancing to boliyan and tappas, and JW Marriott Hotel Pune's scenic rooftop lounge Paasha is perfect for a memorable evening soiree. Be the belle of the ball in a twirl-worthy lehenga and an intricately crafted Kundan choker set by Tanishq Rivaah. Enhance the glamor factor with matching kadas, rings, and bangles. The bride looks stylish with flawless skin, a touch of highlighter on the cheeks and gold eyeshadow. The uber chic look was complete with soft curls and a fuchsia pink pout. Tamil weddings are steeped in thousands of years of traditions and a great way to honor them is by making your way into the kalyana mantapa dressed in colored stone jewellery by Tanishq. The bride flaunts an exquisite piece of art by Tanishq Rivaah crafted with exquisite red rubies, a pair of open Polki earrings and bangles with rows of rubies set in an intricate design. The new-age Tamil bride gets ready for her Muhurtham in an emerald lehenga by Anita Dongre, with her signature gota patti work combined with thread work from her Epic Love collection. She strides down the aisle with her groom who redefines traditions in his beige raw silk sherwani by Shyamal and Bhumika that is crafted with gold and green embroidery. For the Tamilian 'pheras' ceremony, the bride's skin was kept flawless and glowing with coral blush, red lips and defined winged eyeliner. The new-age Tamil bride chose an ornate Tanishq Rivaah pendant Kundan choker set and stacked gold polki bangles to complete the look. The bride looked striking in an unconventional reception look with her beige lehenga with lavender accents and gold embroidery by Shyamal and Bhumika. The groom looked dapper in his long black jacket and ivory churidar, also by Shyamal and Bhumika. For the Tamilian 'pheras' ceremony, the bride's skin was kept flawless and glowing with coral blush, red lips and defined winged eyeliner.